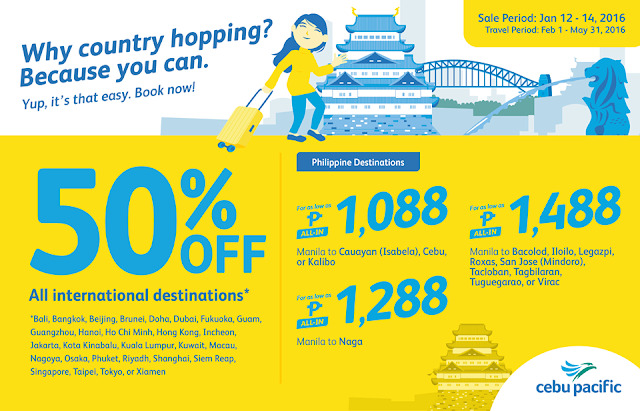 Cebu Pacific Seat Sale 2016! 50% OFF is applicable on fares only, inclusive of 7kg hand carry baggage allowance. The following fees shall apply after discount: PhP 120 web admin fee, PhP 15 Aviation Security Fee, 12% VAT, PhP 50 – PhP 220 and PhP 550 terminal fees for domestic and international flights, respectively, country-specific taxes ranging from PhP 420-PhP 2,195 and check-in baggage. Advertised one-way fares have limited availability and are non-refundable but rebookable subject to the following fees: PhP 1,500 for domestic destinations, PhP 2,300 for short-haul international destinations and PhP 2,800 for long-haul international destinations plus fare difference. For your convenience, flight changes, availing of prepaid baggage allowance for check-in baggage and web check-in service can be done up to 4 hours before scheduled flight. All ATR flights are operated by Cebgo.